I don’t really like e-books. So, when Stephen Fry announced that his autobiography “The Fry Chronicles” was to be released as an iPhone app, I couldn’t have been less enthusiastic. Of course, me being the novelty-seeking geek I am, I still couldn’t help tapping on the link. 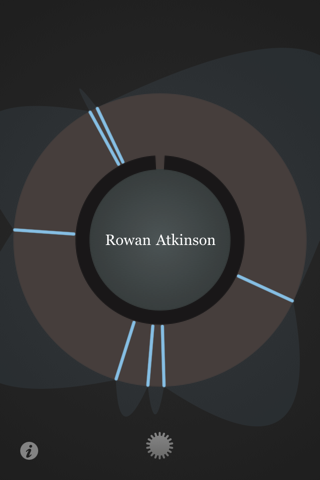 I was intrigued enough by the flowery wheel and the prospect of non-linear reading to, after a few days of putting it off, buy the app. 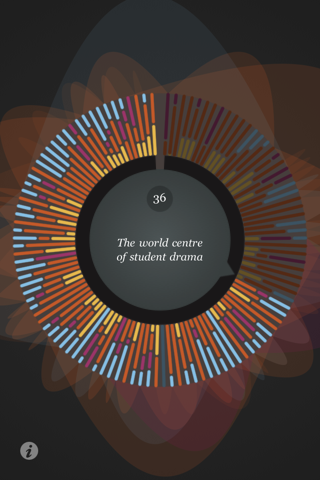 myFry.app is an experiment in reading: The book is split up in 162 shortish “chunks” rather than chapters which are tagged with names of people, themes or places. Those chunks can be accessed by turning the dial on the wheel, tapping and then holding on the screen. 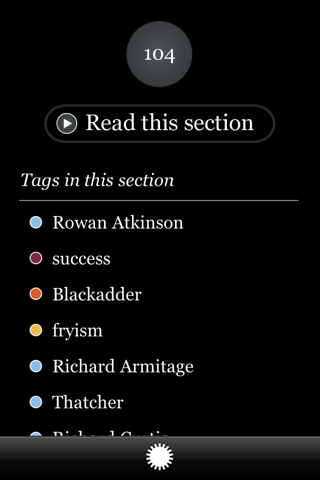 The app encourages the reader to follow tags rather than time, to read the book not sequentially, but randomly. So there I was, playing around with the wheel, finding its behaviour profoundly confusing. I finally managed to start reading the first chunk. Soon, rather than exploring the book through tags, I found myself reading it in the most boring, unexciting, least modern fashion possible: from beginning to end. Somewhere, a clever visionary weeps as I ignore the endless possibilities of tags, touch and technology. It is an enjoyable book, full of wit, wisdom and if I write one more of those terrible three-part alliterations I’m gonna throw this computer out of the window. Where was I? Ah, the book. It’s good, go read it. Stephen has an interesting life that I enjoy reading about. 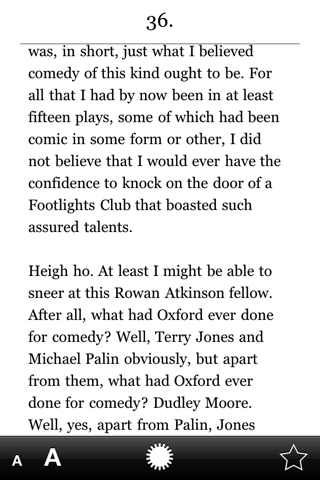 British universities, the comedy and drama scene, and most of all his insightful, self-deprecating honesty make it a great read. What I don’t particularly care for, though, is the app itself. I have no terribly big complaints, don’t get me wrong. The text is laid out nicely, the tags might come in useful if I re-read the book at a later time and it hasn’t crashed yet. It works. What it doesn’t do, however, is change the way I read. Call me old-fashioned and boring, but I enjoy watching a narrative unfold as I read from first to last page. How am I supposed to understand a chapter on Stephen’s work at the BBC if I don’t know how he got there? And who, on Earth, is this Kim? It is reading the book in a linear way that the app makes harder than it should. There is no easy way to just jump to the next chunk, I always need to fiddle around with the wheel. Distracting. Fixing that would be easy, I simply need some navigation at the bottom of the chunks. One button labelled “next part” would be enough. Trying out new ways of reading is great, but it shouldn’t degrade the “usual” reading experience for no reason. Other than that, reading in the app is quite pleasant. It looks great, a lot like Plain Text, the app I use for writing these words in a terribly crowded train on a Saturday morning. The chunks are small enough for very short reading sessions. Instead of checking Twitter at the bus stop, I simply read a part of the book, often receiving strange looks as I chuckled at one of Stephen’s jokes. Watching the wheel navigation slowly fill up with chunks marked as read is gratifying in the same way as seeing a bookmark slowly wander from top to bottom is. It’s a great visualisation of reading progress. In the end, the decision whether to buy Stephen’s book in paper or app form is a matter of taste, not of technology. It certainly is a great book and deserves being consumed in any form. Wow. That kind of made me want to buy the audio book as well.